In the Spring of 2016, I interviewed for a project manager position at ASU’s School of Earth and Space Exploration (SESE). At that time SESE was one of a few finalists vying to win a NASA mission. ASU’s entrant was a mission called Psyche. Psyche’s scope was massive; minimum of 10 years including pre-launch activities, partnering with Jet Propulsion Lab and Space Systems Loral, and years of waiting, analyzing and reporting. I remember when I first heard Lindy (Lindy Elkins-Tanton, SESE’s Director) speak about Psyche and the 500+ page Step 1 proposal to NASA, I immediately started sweating. It is without question the biggest project I have ever even heard of, let alone asked to help manage. This January when NASA officially selected Psyche, those same anxious sweats came back! In the past, I’ve been a part of many projects where, when things went sideways, we would calm everyone by saying “It’s going to be fine! It’s not rocket science!” This time, IT IS ROCKET SCIENCE! Psyche is on the map! Why are we doing this project? What is our role in this mission? My first goal was to start small and work to get answers to these questions from every possible perspective. Working with the stakeholders on the Psyche project is like nothing I’ve encountered before! The team is open to uncovering every detail and digging through every dark corner. We tackled every aspect of our scope to answer questions such as; how will we handle intellectual property (IP) with our capstone students? Government sponsored programs require us to be careful and not profit from IP. Can our contracts team develop an agreement for each participating student to sign? 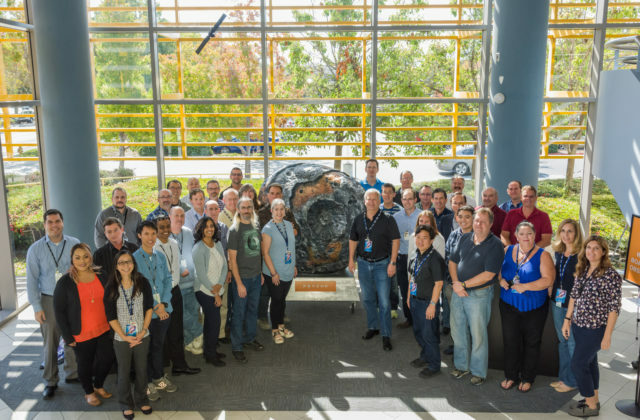 And, how do we successfully partner with JPL to ensure we follow the NASA project management process? JPL will take the lead in this process but we must stay in tight communication with weekly meetings, ad-hoc phone calls, and monthly reports. As I worked with our project’s stakeholders to get answers, the project seemed less scary. With the project’s end in mind and a vision of success, I charted a path forward. All the other aspects of project planning, schedule (scope, roles and responsibilities, etc.) fall into place once you know what, why and when. Often for me taking the first step is the hardest, so getting back to basics and answering simple questions like “WHY?” help me to get organized, motivate teams and ultimately deliver what we promise. At ASU we needed to create a team that hasn’t existed at the university before. We needed to recruit financial team members to create, edit, manage and track our budget. Because we were going to be managing nine subcontractors we needed to enlist a strong contracts team. The university’s portion of the work includes planning and managing the science team, developing the imager, and design, development, and management of our science data center. Our scope also includes student collaborations and outreach, so we need project team members that help integrate and develop teams of faculty, graduate students, undergrads and postdocs; all of these teams are part of our educational and public outreach. All told we need an interdisciplinary cross-section of stakeholders for ASU to perform our role for our real-life mission to visit an asteroid! This is just the ASU portion of the team. The Psyche spacecraft build and mission management is led by Jet Propulsion Laboratory and our spectacular project manager at JPL is Henry Stone. A further, and critical, aspect of team management for a mission became immediately apparent: integration across our many institutions. The Psyche Mission’s project “phase B” — the preliminary design phase, is in full swing. All the things we said we were going to do are starting to materialize. It’s really happening! When I’m in the day-to-day efforts of working with schedules, budgets, stakeholders and meeting minutes, Psyche often feels like any other project, but when I review the overall timeline or hear words like ‘launch,’ I can’t help to scream in my head OMG ROCKET SCIENCE!!!!! I’m so grateful and excited to be a part of this project!